We have been having some sunny days here in Seattle which is always cause for celebration. No, it doesn't really rain all year round. Yes, it really does rain a lot. Yes, you do get used to it. I love the rain but the grey sky does get hard after a while so a bit of spring sunshine is always welcome. In celebration of the sunny weather we marinated and grilled flank steak, served with sour cream parsley sauce. For sides we had grilled romaine salad and potato gratin. Grilled flank steak and potato gratin go well together but gratin is a stand up dish that can be served by itself with a simple green salad to make a satisfying (vegetarian) meal. I was looking for a quick weeknight gratin and found it in Gourmet's cookbook but despite the impressive variety of cheese in my fridge, there was no Gruyere. In the interest of getting my kids to eat it, I went with a simple white cheddar from Beechers instead of something more exotic and the results were great. 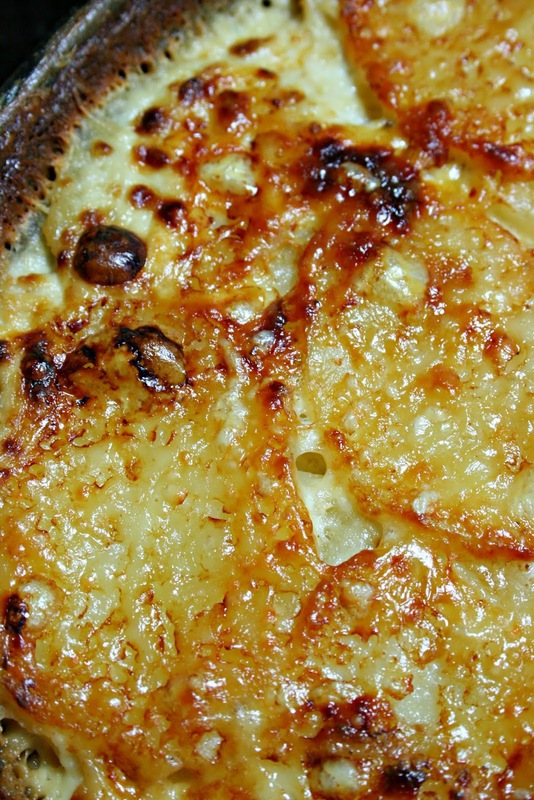 I cooked this gratin first on the stove and then in a 400 degree oven which speeds up the cooking time. Instead of transferring the contents to a buttered dish, I cooked the whole thing in a cast iron skillet. Less things to clean plus I love my cast iron skillet(s). Peel the potatoes and slice them as thinly as you can (or you can use a mandoline). Grease your skillet with the 1 T of butter and leave the remaining butter in the pan. Put the pan over medium heat and let the butter melt and begin to bubble. Add one layer of potatoes and sprinkle lightly with salt and pepper. Repeat until all the potatoes are in the pan. Sprinkle the freshly ground nutmeg over the potatoes. Pour 2 cups of 1/2 & 1/2 over the potatoes. The liquid should come up to just below the height of the top layer of potatoes. If needed, add the additional 1/2 cup of milk to bring it up to the right level. Turn the heat up on the stove and bring the dish to a boil. Sprinkle the cheese on top, transfer the dish to the oven and cook for 30 - 40 minutes until the top is golden brown and the potatoes are soft. Add a green salad for a simple vegetarian meal. Add a salad and grilled flank steak for you meat lovers. Thanks for stopping by. Put that cheese on right before popping it in the oven! Well, we've been having some serious thunderstorms here in the SF Bay--maybe our weather got switched at birth. :) Those potatoes look super creamy & comforting!